Eramosa is a Canadian marble, whose quarries are located in Ontario and produce blocks of medium sizes. 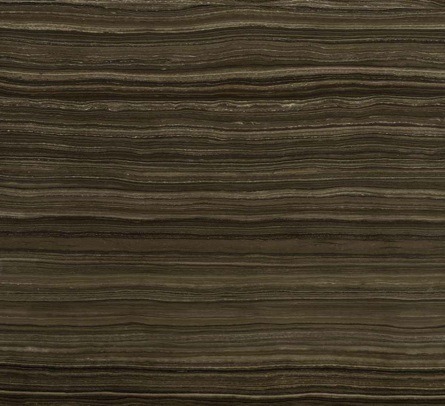 Eramosa is a very particular brown coloured marble: the blocks are veined and depending on the direction of their cut, they origin Eramosa vein cut or cross cut. The blocks of Eramosa vein cut are cut against the vein. The resultant slabs are very regular, the parallel veins decorates the surface of the slabs creating wood-looking patterns. Eramosa is a strong marble, which needs to be resined to fix defects and micro-cracks. Ziche resins all the Eramosa slabs in the modern factory in Brescia (IT), with a triple vacuum epoxy resin process. This process applies the newest technologies to the slabs fixing all the defect and the porosity without affecting their beautiful colour. Eramosa is used for indoor and outodoor applications, for floorings, stairs, ventilate facades, countertops, claddings,..